I just received a reminder that today is the final day for entering the Blogger's Quilt Festival so that is why I have finally organised myself to upload my entry. A couple of years ago I used to dye my own fabrics, but after a relatively short time period I worked out that I could either dye fabrics or make quilts there was not enough time to do both and so I gave up dyeing. About the same time I decided I really should learn to applique and so enrolled in a class to learn how to do it properly. After a relatively short time period I worked out I could either applique and have no enjoyment in my quilting or return to hand piecing and enjoy quilt making and so I gave up applique. 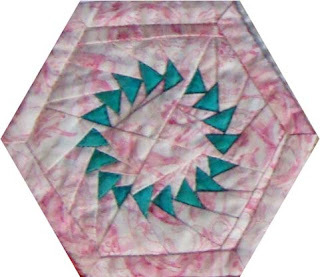 When I started to make the quilt that I hoped would use up all of my hand dyed fabrics I looked for a fabric that would add some strength and colour to the quilt and although I hated black muslin it was the perfect colour for the quilt. 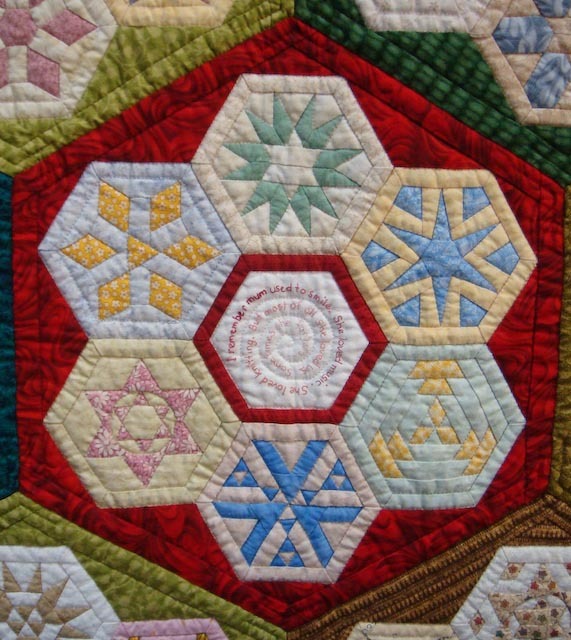 After a relatively short period of time I worked out that I hated the black, hated the applique and was also definitely onto the path of hating the quilt..... noticing a pattern here? In an attempt to get rid of my hand dyed fabric, my appliqued quilt with the black muslin background I knuckled down and finally finished the quilt, only took about five years.. it could have languished in the UFO pile for an eternity. I ended up entering it into a competition and won a prize for Best Use of Hand Dyed Fabrics. 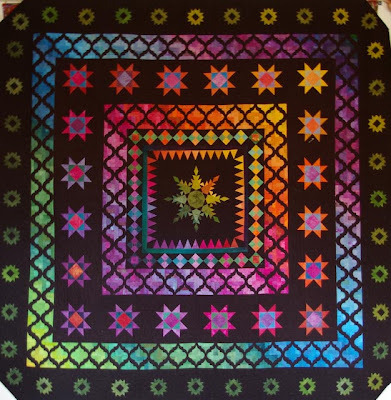 It is quite a dramatic quilt but one must remember why I used so many fabrics in this quilt.... to get rid of my hand dyed fabrics so that I could give away all of my hand dyeing materials and simply get back to enjoying quilting. So what did I win? 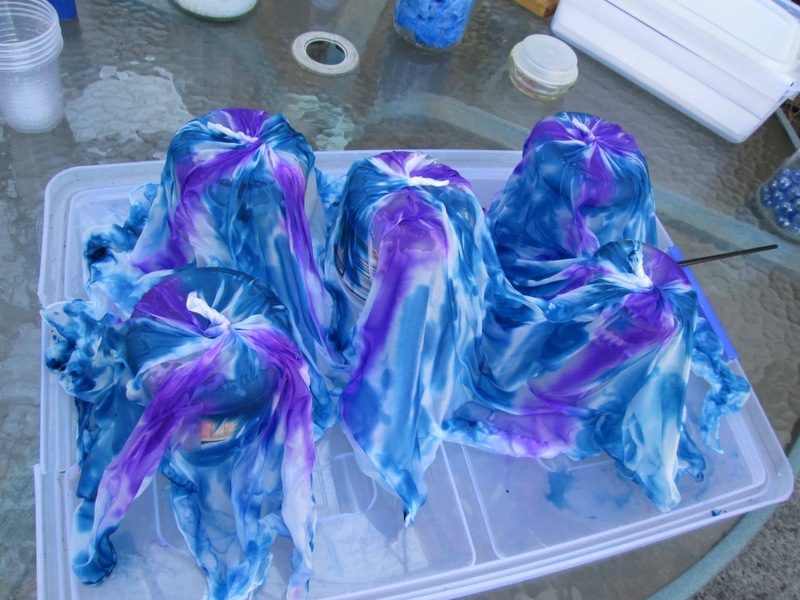 You guessed it $250 of dyeing products:( I figured dyeing silk scarves had to be less messy than dyeing cotton and so purchased some silk scarves with my winnings. 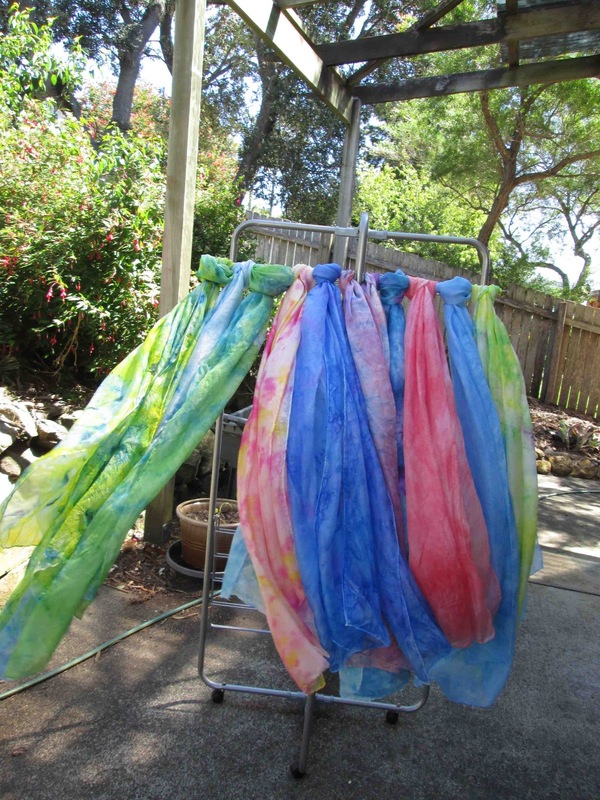 Several years down the line I remembered the scarves and last weekend a friend loaned me her silk dyeing dyes. Voila! 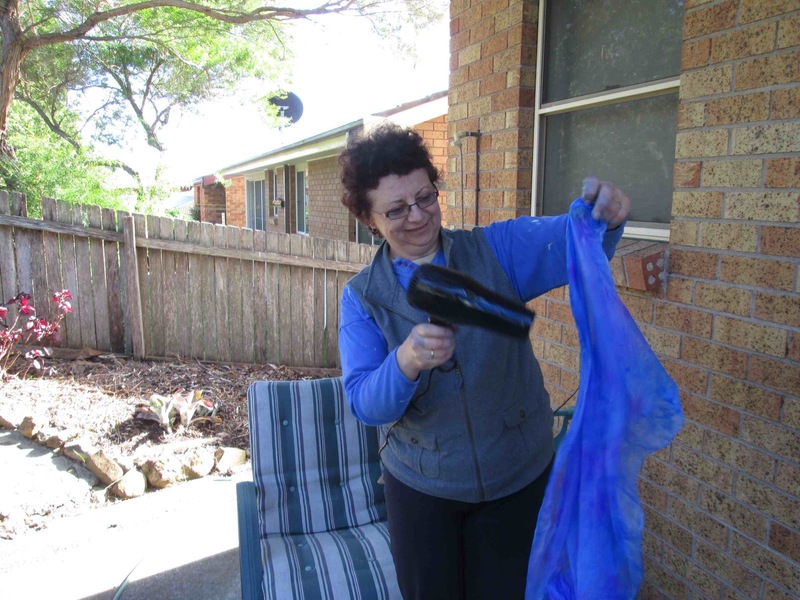 Silk scarves dyed, dried (with the hair dryer) and blowing in the wind. 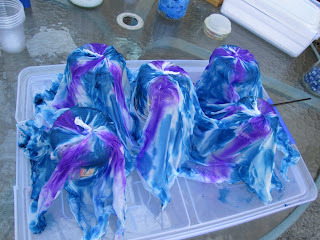 Perfect finish to my dyeing and appliqueing attempts. The finished quilt is huge, a big queen size, of about 100in x 100in. 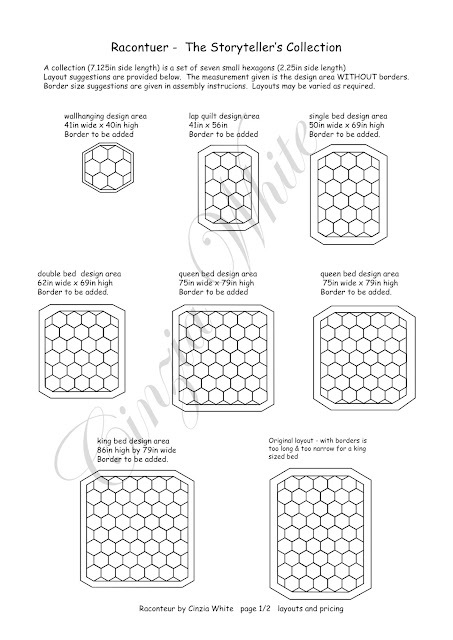 If you want the pattern it is available on my website I would love to see what it would look like in other fabrics. What category am I entering in? Well I would say it is definitely a ROYGBIV (colour wheel quilt), that was one thing I wanted to achieve and I think I was successful with. 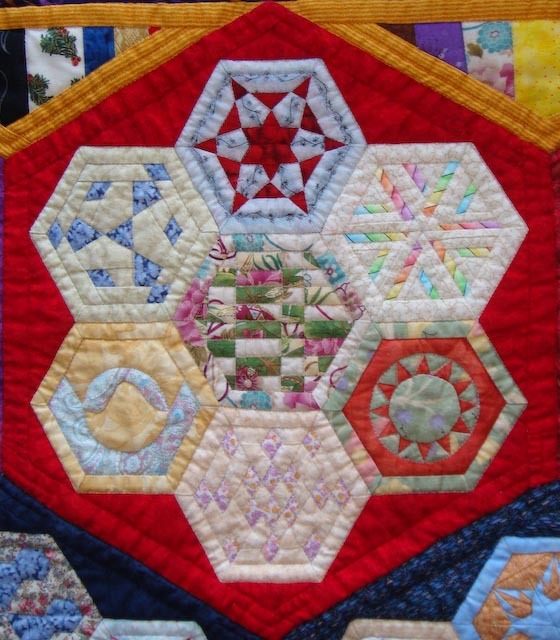 Go and check out the other entries in the Bloggers' Quilt Festival.... and vote for mine too if you like it. Well I have finally finished the block. 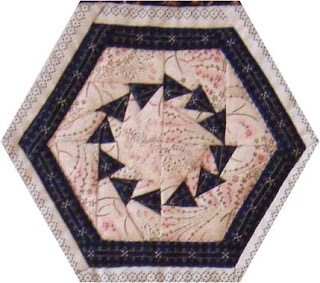 Here it is in Civil War Reproduction Fabrics. Doesn't it look different. I have included another of the collections from Raconteur so you can see the change. The blocks from Snippets, the one just here to the left were put together to show how different a collection would be if there was a stronger focus on dark colours. I hadn't intended initially to add the white sashing but, unlike Raconteur, the blocks clashed when they were laid side by side and so the sashing was needed. 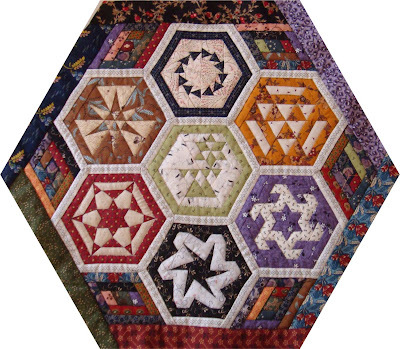 I have always loved scraps and so adding the log cabin corners was the perfect way to bring the seven hexagons into one collection. The different coloured borders carried the scrappy feel right through to the edge. Since finishing this collection I have been playing with how to finish off the whole thing. If I leave it at just one block then what you see is all that there will be but I have found a great way to join several of these collections with what appears to be a spiral.... so if the interest continues you may in some time in the distant future see another development... or then I might simply move on and finish some other quilts. So why did I call this post Cobargo Retreat? Well because that is where I will be teaching this class. I can't wait to see what combinations other people will choose, both in colours and fabrics. Also in blocks as at the retreat they all start with the same four blocks but then they can choose up to three different blocks to complete their collection. It should be interesting. 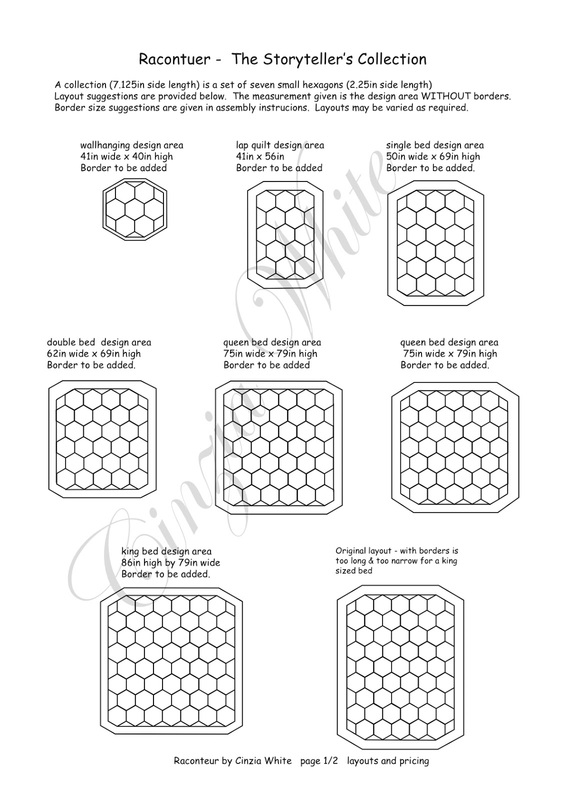 I thought I would upload a few more block pairs from Raconteur so that people could again see the difference that colour makes to a block. Although the first two blocks aren't identical you can see that they are almost the same. Doesn't the dark frame add a class to the block. Or perhaps that is because, being civil war reproductions it was a more serious time and the fabrics reflect this and are more sombre. Whatever the reason the change gives a different feel to the block. The second pair or blocks are both at odds with the rest of the blocks in their respective collections. 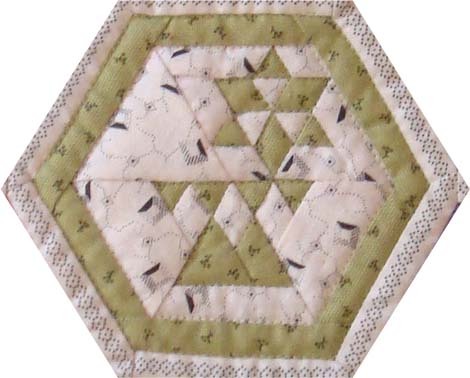 This block, Crystal Dreams, appears quite soft when made in the pale green of the civil war fabrics. It will most likely be in the middle of the collection being the 'odd man out' of that collection. The final block is the same one from Raconteur. By the time I came to make it I was fed up with all of the soft wishy washy backgrounds and decided to add some life. Funny when I was looking at the separate fabrics there appeared a stronger contrast between the two fabrics. Another lesson learnt that in miniature it is important to look at every piece of the fabric. I still liked the finished block although others haven't been as keen on it... but then again it is my quilt. The title Raconteur - A Storyteller's Collection comes from the fact that all of the blocks within the quilt are named and each represents either an event that happened or place that I visited whilst I was making it. A few blocks are named after something significant that happened previously in my life. 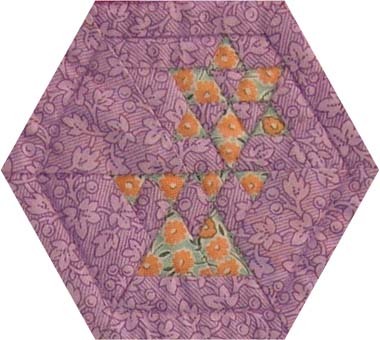 The central block in this collection is called "I Remember", which I wrote for my mum. Mum unfortunately has dementia. when I made the block she had been suffering with it for about three years and by that stage although she could remember that I was a significant person in her life she no longer remembered who I was. Although there are six children in the family she had not seen most of the others for quite a time and as such they were total strangers to her. I remember Mum use to smile. She loved music. She loved knitting, but most of all she loved us. Sometimes she forgets. Unfortunately now she remembers nothing. I am luckier than my siblings. I at least had the advantage of spending time with her in the past few years while she could still remember.